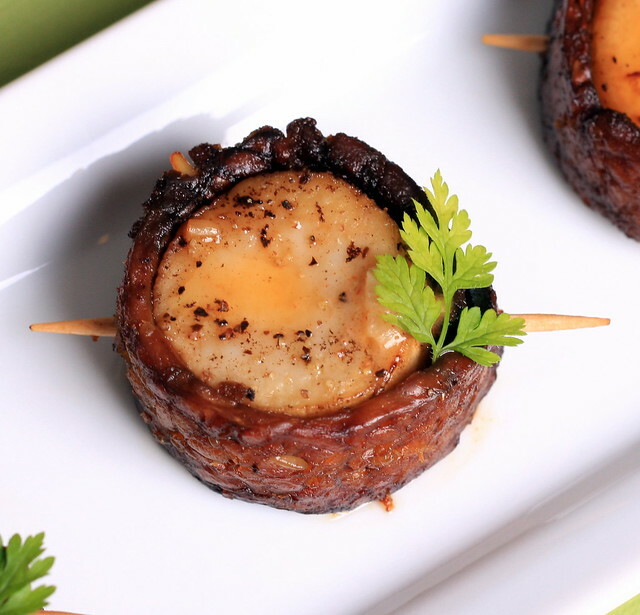 I’ve never had a bacon-wrapped scallop before, even when I ate meat. However, I wanted to replicate this dish simply because I love the concept of tiny, fancy and sushi-shaped food. These one-bite appetizers were easy to make, used only a few ingredients and tasted amazing. Here I’ve used sliced king oyster mushroom stems for the scallops (an idea I read about in Tal Ronnen’s The Conscious Cook), Lightlife’s Organic Smoky Tempeh Strips and a garlic cream sauce with a pinch of smoked paprika added in at the end. This is succulent, smoky, rich and salty—and perfect to make for a small dinner gathering or as a starter for two. Melt the vegan butter in a large saute pan over medium-low heat. Add in the garlic and allow to soften for about 30 seconds. Add in the coconut cream and saute for about a minute. Turn the heat up to medium and add in the broth. Allow to sizzle for a minute or two, then whisk in the paprika. Remove from the heat and transfer the sauce to another bowl. Return the pan to the stove and allow it to heat for about a minute over medium heat. Add in a little olive oil or vegan butter, then very carefully place the mushrooms into the pan. (Since they contain water, they will sputter once they hit the heat.) Place a lid over the top and allow the mushrooms to cook for about 3-4 minutes on each side, or until they are slightly brown on top. Remove from the heat and transfer to another plate to cool.In the same saute pan, add a little more oil if the pan is dry, then add in the tempeh strips. Allow to cook on each side for 4-5 minutes, checking them occasionally to ensure they do not burn. Once they are almost done, add a few dashes of liquid smoke, then allow it to sizzle, then remove from the heat. 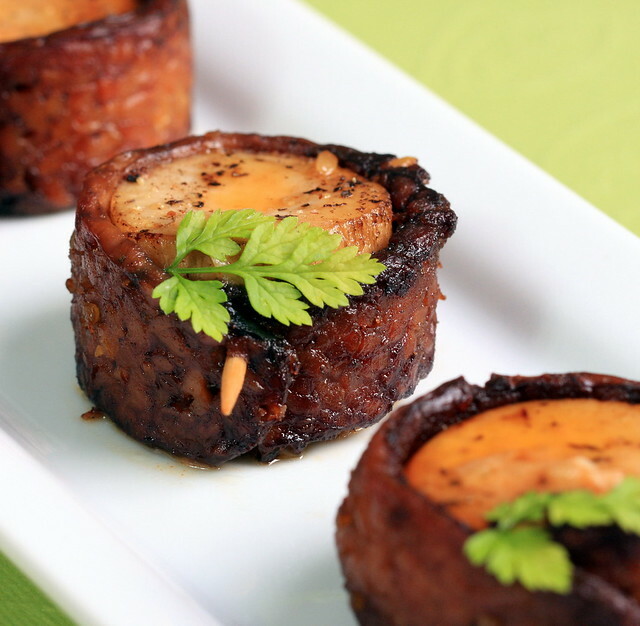 Wrap a piece of tempeh around the scallop so both end slightly overlap each other. Cut off any excess, then spear with a toothpick. Spoon an little of the sauce over the top and serve immediately. These look amazing! I just hope I can find some oyster mushrooms! One word for this recipe- WOW! I am drooling over here. Wow. These look amazing. These are super impressive for such simple ingredients! This recipe makes me want to host a cocktail party just so I have the excuse to serve such fanciness! Oh my! This is incredible! I will definitely be trying this at my next dinner party. Wow. Just wow. you make such magical food, erin, and your husband takes beautiful photos of it. these look so savory and delicious, i could jut about pull them out of the computer screen with my fingers. aw, thanks Caitlin! I shared your comment with jeff. Beautiful photos! They look too pretty to eat. Although I wouldn't mind eating one or two of those right now. Yum! Woah this is so clever and they look delish- the photos are beautiful too! These are amazing! Your food photography is stellar, btw 🙂 Happy MoFo – I am excited to spend a month watching your creations! Great use of mushroom stems! Wow, those are flippin' pretty! So creative, fancy, and gourmet! wooooaaa that looks so fancy and tasty! Oohers this does look very elegant! I love the idea of using mushies – that means this is something I could try! This looks lovely! 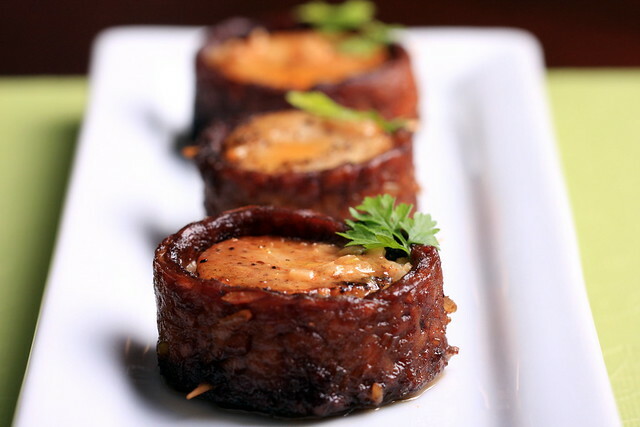 I think I'll try it with some tofu bacon because I'm not the biggest fan of tempeh bacon. how did your husband like this? i'm sitting here wondering how mushroom stems compares to scallops. this item would totally blow my friends' minds if i were to ever serve them this. you come up with the best ideas for food! He liked them! The secret here is to soak the sliced stems in water so they cook up soft like a scallop. Easy peasy! Thanks Lan! wow- stunning in appearance, and I'm betting they tasted great too:) Clever girl! I have no words for this except for 'Yum' and 'Seriously?' – love it! Wow I'm actually obscenely excited to make these. I have missed seafood so much since I went vegetarian and these just look so freaking goooood! Amazing! Way to start Mofo with a bang! I must try this as my husband is a scallop lover. Oh, I SO hope you are secretly working on a cookbook… I will buy every copy. :)Seriously, though, your recipes often remind me of Peter Berley's or Myra Kornfeld – high praise, as I am sure you well know! wow. they're stunning. must try. thank you! The 3rd(?) recipe of yours that I will be making tonight. Thank you. You're teaching me how to cook! I wanted to come back and comment… I've made this recipe twice now, and it's been wonderful both times! I now keep a regular supply of french horn or king trumpet mushroom at home for when vegan scallops are mandatory (which feels like every day). And who knew that I would eventually love tempeh?! Thanks Nina! I do the same thing with the mushrooms. : ) Glad you like the recipe! Is King Trumpet the same as King Oyster? I’m a forager, and in the wild, “trumpets” and “oysters” are different. Though, trumpets, a member of the chanterelle family, would be awesome for their sweet buttery flavor — except you’d need the whole mushroom. I’ve never heard of King Oysters — no idea where to get them. So glad to see posts of having tried this! I’m going to try it with carrot “bacon” though — really don’t like tempeh. Fantastic. I love your blog and as an ex-pro photographer, your husband does an excellent job of photographing your cooking. Its a sign that you both have passion for what you do. Glad you enjoyed, awesome review! Thanks! We also made your calzones, I'll let you know when the review is up. Spoiler alert: it was awesome! haha, awesome … glad you enjoyed! Would this be appropriate for a potluck (where it would cool down)?